Weather is the present condition of a place with respect to the atmospheric pattern determining the pressure, precipitation and hotness or coldness of that area. It is determined by the temperature, humidity, rainfall, wind speed etc. Sun is the most influencing factor of the weather. Climate is the average weather pattern of a place taken over a period of 25 years. Animals in general have a tendency to adapt themselves to the climate of a place. Animals may migrate to different places to escape from cold and harsh conditions like the polar region. Many animals migrate to the tropics because of the favorable climate and hospitable environment. Weather is the present state of the atmosphere at any given place at a particular time. Weather usually changes very rapidly at times, varying even at hourly basis. Weather is different than climate, because weather is a daily affair whereas climate is a taken over a period of time. 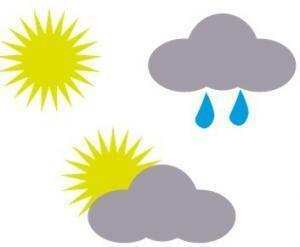 There are five factors that determine the weather. 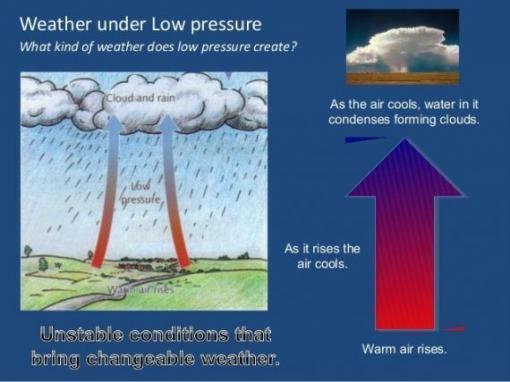 These factors can cause different properties in sections of the atmosphere or air masses. We have learnt about how the atmosphere is divided into numerous layers that encircles the Earth. Winds affect to a very great extent the amount of rainfall in an area. Any given location receives rainfall with respect to the amount of moisture they are carrying. The winds can move air above the ocean onto a continent bringing moisture to it, or winds may move air masses from continent to the ocean, moving drier air from the continent. it can hold more moisture. That’s why we feel very sticky in a very humid day. The amount of moisture air contains is visible when condensation happens as fog. Humidity is measured using a hygrometer and is measured as a percentage. Air pressure is determined by the amount of air that is pushing down on you from the atmosphere. Air pressure is the total pressure exerted by the air in a certain mass of air. When we go up a building in an elevator or uphill climb on a mountain we feel the change in the air pressure affecting our body especially our ears. The higher you are, the less air is pushing on you, so there is less pressure. 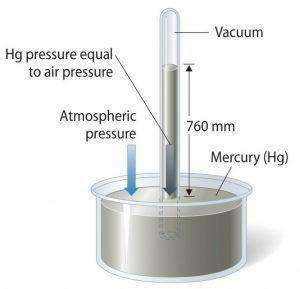 Air pressure is also called barometric pressure because it is measured using a barometer and commonly measured in inches of mercury. Air mass differ in amounts of pressure on us just like altitude. When the air is under high pressure, it is light, clear and warm. But has a tendency to absorb more moisture, while low-pressure systems are cooler and heavier and mostly ends up producing storms. Temperature is the total heat in a substance. To determine the weather air is considered. 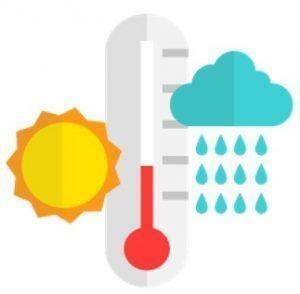 Temperature is measured in degrees Fahrenheit or Celsius with the help of a thermometer. Temperature of the air rises when the molecules in the air move faster. This happens because of heat. Hence amount of heat in the air determines the speed of the molecules in the air. The heat we get is from the sun and changes in different atmospheric layers. All layers of the atmosphere are different in temperature. The temperature of an area is how much sun’s energy is received by it. The air gets cooler and cooler with the rise in altitude. The most important factor that is essential to determine weather is temperature. In the summers, some clouds out in the sky give us immense relief. And sometimes huge dark clouds make a hot day even hotter. Clouds have a good amount of dependency on the weather conditions of an area. We do feel sometimes that clouds play essential role in cooling a particular area but they also trap a lot of heat within. When the rays of the sun enter the Earth’s surface, some of it is reflected off. This means that more cloud covers creates a substantial cooling effect: more radiation reflected means less heat present in the atmosphere. But when we find that a certain area experiences longer duration of cloud coverage and also the type of cloud which is present in the sky. It obviously takes longer for the earth to heat up. Consistent cloud cover in a given area keeps the ground quite warm. The term thermal radiation is used to understand this heating up of a particular area where heat is reflected off of Earth’s surface and is then reflected off of beneath the clouds, trapping it underneath. Some days when there is low visibility of dense clouds, most of the heat that is reflected off the Earth comes back from the bottom of the clouds. Clouds are comprised of water vapor, which act as a very strong greenhouse gas. 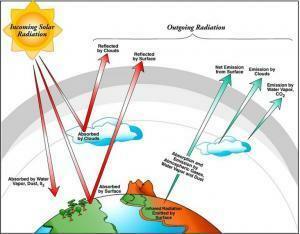 Greenhouse gases cause about 50% of heat to be trapped, contributing to warming. Sun’s rays travel through the clouds and heats the Earth. The Earth reflects and radiates that heat back up in the atmosphere. 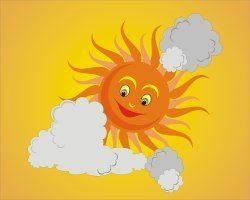 Whenever there is a thick cloud cover, some heat is absorbed by the cloud layer and keeps the Earth warm and insulated. The absorption is due to the greenhouse effect, the Earth getting warmed up and the heat trapped in the atmosphere. 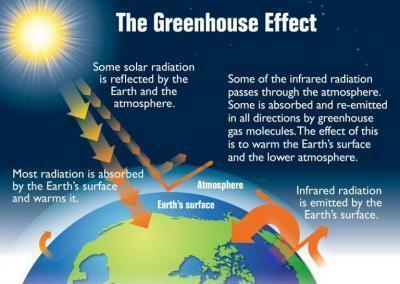 Carbon dioxide and water vapor contribute greatly to Green house Effect. ………….. is the present atmospheric condition of a place. ………………is the average weather pattern of a place taken over a period of 25 years. 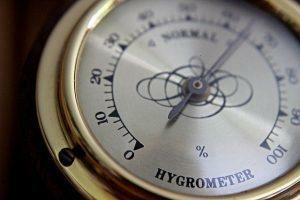 Air pressure is also called …………… pressure because it is measured using a barometer. Humidity is measured using a ………………. and is measured as a percentage. What are the factors that determine the weather of an area? What do you understand by humidity? Humidity is a measure of the water vapor present in the air. The amount of moisture in the air can vary widely depending on the conditions. In the winter, air is generally cooler and drier, whereas in the summer when air is warmer, it can hold more moisture. Air pressure is the total pressure exerted by the air in a certain mass of air. It is determined by the amount of air that is pushing down on us from the atmosphere. A barometer is used to measure the air pressure.